BlackHat ransomware uses sophisticated techniques to infiltrate computers and hide from its victims. Use Reimage to determine whether your system is infected and prevent the loss of your files. BlackHat ransomware is a virus that focuses on data-locking because it ensures the profit from ransom paying victims. BlackHat ransomware is a virus that appends encrypted files with .BlackHat file extension by using a strong encryption algorithm, and makes data unusable. When this is done, malware contacts C2 server and generates the ransom note ReadME-BlackHat.txt which is inserted into each of the folders where encoded files are located. 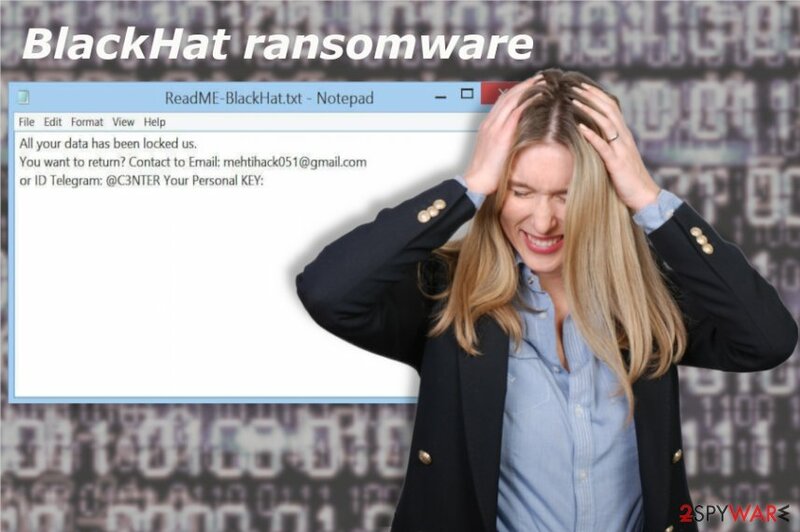 This text file informs victims what has happened to their computers and data stored on it, and explains that users need to contact the hackers behind BlackHat ransomware using mehtihack051@gmail.com email address. While this crypto-virus is not decryptable, users should not risk contacting cybercriminals as they may be scammed. BlackHat ransomware virus compromises the machine by adding various system files and registry keys. It might make new Windows Registry entries to achieve the persistence and ensure that malicious processes can be launched. These entries are typically created to start the BlackHat virus automatically each time Windows OS is booted. The cyber threat focuses on file-locking and demanding ransom, so after all initial system changes, it starts encrypting your personal files like music, photos, archives, databases, and documents. Then it marks files with .BlackHat file extension which makes them unusable. BlackHat ransomware developers don't provide much detail about the attack. Only contact details and personal key are mentioned, which are enough for crooks to come in contact with victims, although doing so is not recommended. It is also unknown what size the ransom is, however, cybercriminals usually demand payments in Bitcoin. Paying the ransom BlackHat ransomware developers demand is not a good idea because it can lead to permanent data and also money loss. You need to get rid of this virus and then restore your locked data using file backups. However, you need to remove BlackHat ransomware from the system entirely before you plug in a backup device. Researchers advise performing virus termination with reputable tools like Reimage and only then attempting data restoring procedures. Beware that BlackHat ransomware removal is not enough, as other malicious elements can be hiding on your system. Thus, perform a full scan with anti-malware software and only then replace encrypted files with the ones from the backup. If you have no backups, you can employ data recovery tools listed down below. BlackHat ransomware virus is a cyber threat that displays a short ransom note with the contact email and ID. However, you shouldn't contact these cybercriminals. Ransomware is spread around the internet via spam email campaigns when email attachments contain malicious macros. When you download and execute the document on your device starts the data encryption procedure. These emails often pose as legitimate notices from service or companies. It may look safe because of the name of a company or the subject line suggesting that the email contains important financial information. However, beware of typos or grammar mistakes in these emails and scan the file attachments before opening them. This can help avoid malware infiltration. To remove BlackHat ransomware and all related files, you need to employ anti-malware tools like Reimage, Malwarebytes MalwarebytesCombo Cleaner or Plumbytes Anti-MalwareMalwarebytes Malwarebytes and scan the system thoroughly. As soon as ransomware is eliminated, the machine is safe to use again; however, malware elimination will not restore the locked files. 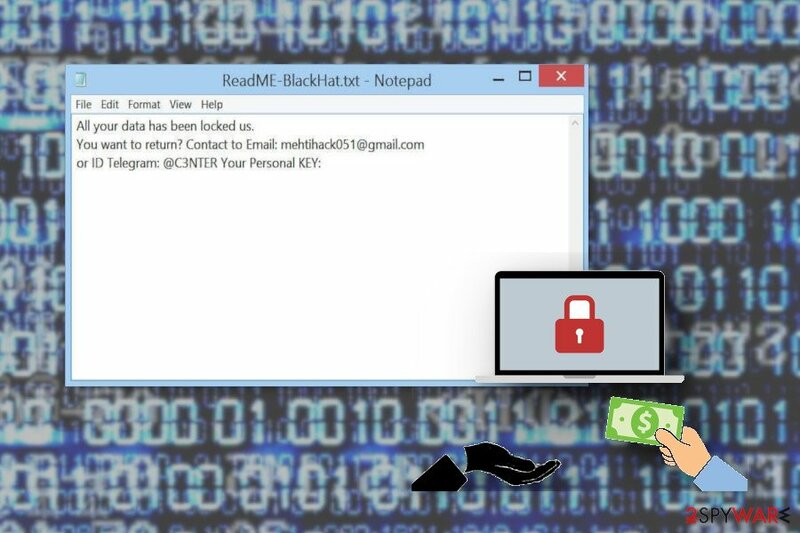 Automatic BlackHat ransomware removal is the best option when you are dealing with crypto malware because it is one of the most dangerous types of cyber threats. This is also important because you need to have a clean device if you want to add files from a backup or cloud service. In case the infection is not terminated, all your backup data will be encrypted again. Log in to your infected account and start the browser. Download Reimage or other legitimate anti-spyware program. Update it before a full system scan and remove malicious files that belong to your ransomware and complete BlackHat removal. When a new window shows up, click Next and select your restore point that is prior the infiltration of BlackHat. After doing that, click Next. Once you restore your system to a previous date, download and scan your computer with Reimage and make sure that BlackHat removal is performed successfully. 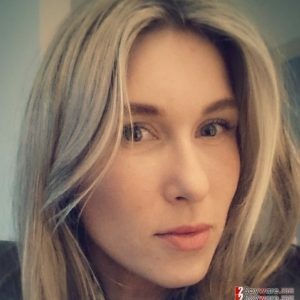 Guide which is presented above is supposed to help you remove BlackHat from your computer. To recover your encrypted files, we recommend using a detailed guide prepared by 2-spyware.com security experts. ^ Margaret Rouse. Encryption. Techtarget. Search security. This entry was posted on 2018-11-20 at 04:16 and is filed under Ransomware, Viruses. You can quickly scan the QR code with your mobile device and have BlackHat ransomware manual removal instructions right in your pocket. How did you remove BlackHat virus?